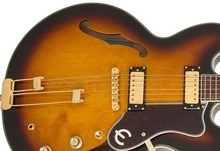 Gibson 50th Anniversary 1963 ES-335 - Historic Burst - "Crossroads 335 inside :-)"
Cort Source - "Super rare, "Cort Source Performer , WOW" "
Guild Starfire III - "Still a Great Guitar Holding a Lot of Memories"
Oscar Schmidt OE40 - "Great jazz guitar"
Rickenbacker 360/12 - Fireglo - "Disappointed. Sooooo disappointed"
Rickenbacker 620 - Fireglo - "A terrific instrument!" Keiper 115 - "Excellent basis for hot rodding"
Ibanez AF71F - "Ibanez AF71F Modified." Harley Benton Manhattan Standard - "For Jazz – but not only"
Gretsch G6131T-TVP Power Jet Firebird - Firebird Red - "Unique"